In modern times, the health of an economy is deemed far more vital than that of the ecology. Re-routing rivers, realigning waterbodies, focusing on monoculture cultivation, creating cities next to transport corridors and then transporting water to places with scarce groundwater has become the norm across the world. Sudden prosperity may validate this development pathway, but the irrevocable damage to nature is catastrophic. Aral Sea is one such story. 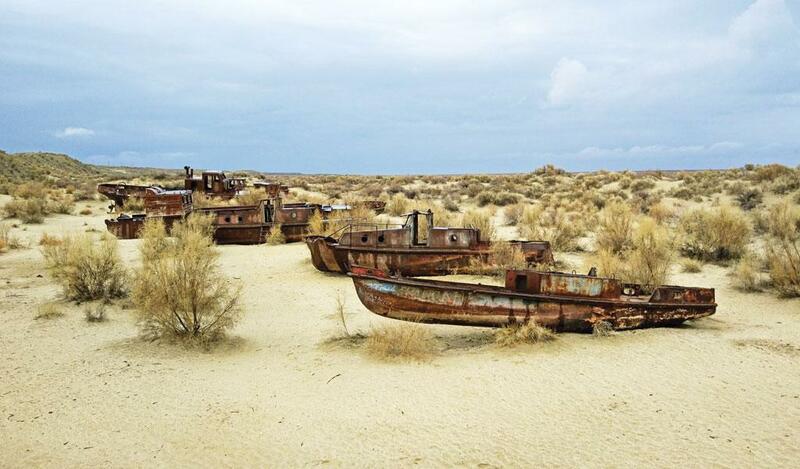 In the 1960s, the Aral Sea region used to support a thriving fishing industry. Even earlier, the Amu Darya and Syr Darya river basins, which used to feed this inland lake, provided water to the oasis towns that gave birth to the historic Silk Route. During the Soviet rule, Uzbek towns near the Aral Sea were forced to shift their livelihood to cotton monoculture farming. Ill-conceived Soviet irrigation schemes reduced the water flow from the rivers needed to replenish the Aral Sea. Today, the lake—which was called a sea due its sheer size and salinity—has reduced to a mere 25 per cent of its original size. From being as big as the state of Punjab, it is now smaller than the size of Goa because of the re-routing of Amu Darya and Syr Darya to give impetus to cotton production. Although the Aral Sea disaster—a human-made environmental catastrophe—was realised in the late 1990s, its consequences are becoming even more evident today. In the 1960s, the depth of the lake was 68 metres. Today, it is less than 10 metres. A relatively shallow water level spread across a large surface area has led to faster evaporation. This has caused over 90 per cent loss in the volume of water in the last six decades. Once the world’s fourth-largest lake, it now hosts travellers who visit to witness the apocalyptic landscape. The Aral Sea is a terminal lake with no outlets. As it lies in a rain-shadow region, the rate of evaporation far outweighs the rate of precipitation. Nukus, a town on the south of the Aral Sea, receives an average annual rainfall of just about 100 mm. The need to strike a balance between the river feed, precipitation, evaporation and seepage has made it difficult to ensure its survival. Any change in any of these four factors affects the quantity and quality of water, rapidly. Therefore, the reason of ongoing disaster lies beyond the northern region of Kaza-khstan and the Ustyurt Plateau region that includes the critical mass of the Aral Sea. The shrinking of the Aral Sea has already changed the climate in the region to the point of no return. With gradual desiccation over the years, the lake bed has got exposed. Dust plumes are often seen rising from the sediments of the lake bed. These dust storms have made regional winters colder and summers hotter. They have not only worsened air quality for the nearby residents, but have also affected crop yields due to heavy salt-laden particles falling on arable lands. There has been an increase in the abstraction of groundwater throughout the basins of the two rivers. The water is pumped out at the upstream of the Amu Darya River that feeds the Silk Route towns—Bukhara, Samarkand and Tashkent in Uzbekistan. The outflow from these towns does not balance the inflow. 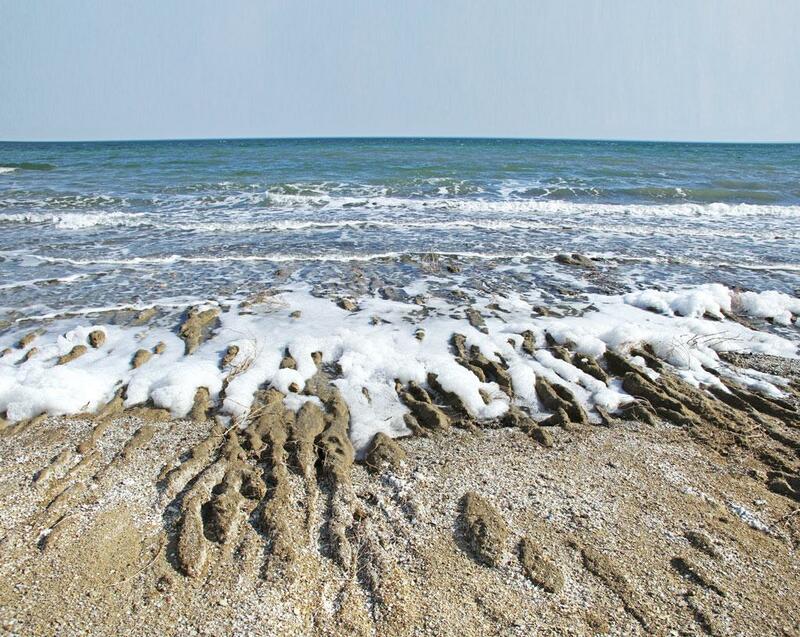 Increase in evaporation, coupled with reduced groundwater inflow and precipitation, has further led to salinisation and the foaming of water in the central part of the lake that comes under the jurisdiction of Uzbekistan. What was once a huge lake is now an endless desert called Aral Qum. Barsa Kelmes, one of the lakes, is now covered with a solid salt crust. The shore of the lake is covered with carcasses of dead insects, revealing the damaging impacts of hyper-salinity. Sudochie Lake is now a marshland. Long grasses have taken over the shore giving rise to marshland fauna. The fishing community, which used to depend on Sudochie Lake, has deserted Urga town, which now resembles a distant ruin. Like the oceans, the Aral Sea basin has become a huge salt collector. Most of the salt is accumulated below the soil forming a sub-soil layer. During irrigation, the water dissolves some of the salt and seeps into the surface. This secondary salinisation makes it impossible for crops to survive. The entire town of Nukus is now saline. In a way, the irrigated farming invited its own death. And to make the matters worse, farmers try to reduce the salinity by waterlogging, which, in turn, brings more salt to the surface. As salinity permeates downstream, it spreads across the delta area, furthering desertification. The south-west edge of the Aral Sea has eroded, forming large canyons along the Ustyurt Plateau. These canyons were formed by a process of long-time erosion. The Ustyurt Plateau, which overlooks the western edge of the Aral Sea, is a clay and stony desert with an average elevation of 150 metres. In geological terms, it is called “Sarmatian limestones” with separated edges leading to steep slopes. The apocalyptic landscapes are now littered with the scattered remains of the ships that could not move due to the rapidly receding water levels. Muynak, the last destination town near Nukus, houses the graveyard of ships. There’s an interesting demographic shift in the region with the young and the working population moving to cities in search of better education and employment, leaving children and their grandparents behind. The town survives on the salaries earned by the younger generations or by tourists who come to observe the disaster. Recently, Uzneftegazdobycha, a private company, designed an easier and cheaper method to explore hydrocarbons below the former seabed. The Uzbek government and the people in the region see this as an opportunity to earn additional revenue. But intensive development of oil and gas fields will further dry up the Aral Sea. EU Today reports that the area earmarked for prospecting and drilling are located in the natural caverns that retain a part of the Aral Sea. The water in these caverns needs to be drained for this purpose, thus, furthering the disaster. The Aral Sea catastrophe exemplifies the Anthropogenic era. This human-made disaster is affecting the ecosystem for more than five decades now. Yet, the current development paradigm is conveniently ignoring the long-term repercussions and is choosing the option of altering the waterbodies to suit bigger and profitable agendas. The current state of the Aral Sea needs to be understood and its lessons be applied whenever we think of altering the course of any waterbody. In 1993, Central Asian countries—Kazakhstan, Kyrgyzstan, Tajikistan, Turk-menistan and Uzbekistan—established the International Fund for Saving the Aral Sea to rehabilitate the affected region ecologically. The mission was to save the people living in Aral Sea basin by improving their living conditions. In 2005, the Kokaral Dam was built in a joint collaboration between the Kazakh government and the World Bank to restore the delta and the wetland region in Syr Darya River basin. The Uzbek government is also damming the small waterbodies that remain. However, these sporadic efforts are not enough to revive the basin spanning seven nations. A cross-country method needs to be put in place by owning collective responsibility. Because it may take many generations to revive the lost lake back to its original glory. This story was first published in the August 1-15,2017 issue of Down To Earth magazine under the headline "Aral apocalypse".